The damage caused by austerity-driven bailouts in Greece could raise the issue of legal liability of the EU institutions and possible compensation, according to Olivier de Schutter, a former United Nations Special Rapporteur on the right to food. “The level of the damage could raise the EU liability but the problem is identifying those who have been affected directly by the austerity measures and who could take the case to the court,” he said. De Schutter said Article 340 of the Treaty on the Functioning of the EU “states very clearly that the damage caused as a result of the fault of the EU institutions is damage that should be compensated for”. “I know some people are thinking about this and I’ve been asked to provide advice on this possibility,” he added. De Schutter, who served as the United Nations Special Rapporteur on the right to food from 2008 to 2014, commented on a report released on 20 November, which concluded that the austerity measures taken during the Greek crisis led to a violation of the right to food. He noted that the right to food was simply ignored when austerity measures were designed and implemented in Greece. The authors of the report wrote that Greece exited the eight-year bailout programme last August but it was now time to discuss what austerity left behind, especially when it comes to the sustainability of rural areas and the right to food. According to the “Democracy Not For Sale: The Struggle for Food Sovereignty in the Age of Austerity in Greece” report conducted by the Transnational Institute, FIAN International and Agroecopolis, the bailouts dealt a severe blow to Greece’s rural economy. The report noted that almost 40% of rural citizens in Greece are at risk of poverty, while unemployment in rural areas soared from 7% in 2008 to 25% in 2013. Similarly, the rural income per capita dropped by 23.5% during the 2008–2013 period. In addition, food insecurity doubled during the crisis from 7% in 2008 to more than 14% in 2016 while 40% of Greek children face material and social deprivation. The situation took a particular turn for the worse in 2010-2013, when food prices rose while the income significantly dropped. The authors of the report noted that especially smallholders were tremendously affected due to the increase of social contributions, taxation on land and income as well as the VAT increase on agricultural supplies. The report explained that the Greek agricultural sector was already vulnerable before the crisis. When Greece joined the EU in 1981, it was a net exporter of agricultural products. But since then, it has struggled with food trade deficit and started becoming dependent on imports. 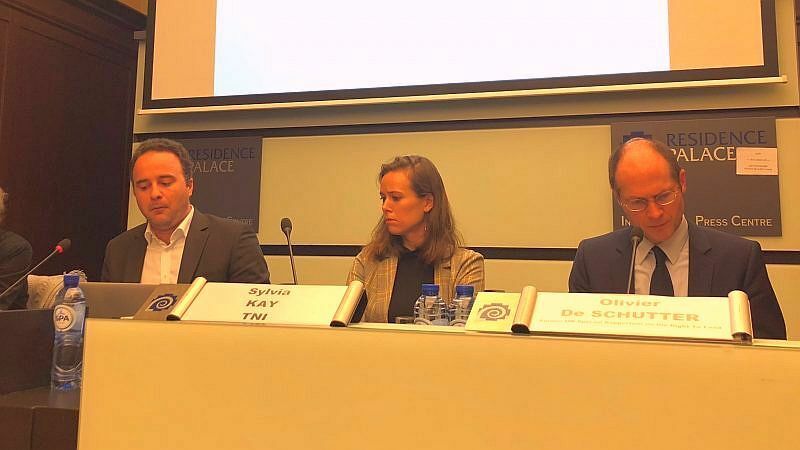 Commenting on the findings, Harry Konstantinidis, a co-author of the report from the University of Massachusetts, said an already vulnerable agri-food sector was further squeezed during the implementation of austerity policies. “We highlight that the right to food as a human right was severely undermined during the crisis, as the share of people in Greece who experience food insecurity increased, according to Eurostat, from 7.6% of the population in 2009 to 13.2% in 2017,” he said. “We are exploring which actors have to be held accountable for this failure, and seek to contribute to a discussion about policies and people’s responses that would strengthen sustainable food production and access to food both in Greece specifically, and in Europe more generally,” Konstantinidis added. Sylvia Kay, a political scientist and co-author of the report, said that several citizen-driven initiatives were taken during the crisis and highlighted the role of different social entities that showed solidarity toward those in need. She also referred to the “From grower to consumer” initiative, which aimed to shorten the food supply chain by removing the intermediaries to achieve better prices for the consumers. According to Kay, the initiative “threw a lifeline” to the people in need as they managed to purchase food 20-50% cheaper compared to the supermarket prices. Yes but where are the responsibilities of the Greek governments? Where are the responsibilities of SYRIZA-Independent Greeks governemnt? Are you trying to whitewash them? It is pitty that the ppl in Greece are used for political reasons, but it should be expected by TNI. However, Mr De Shutter is proving to be a genuine leader for the extreme left and right.